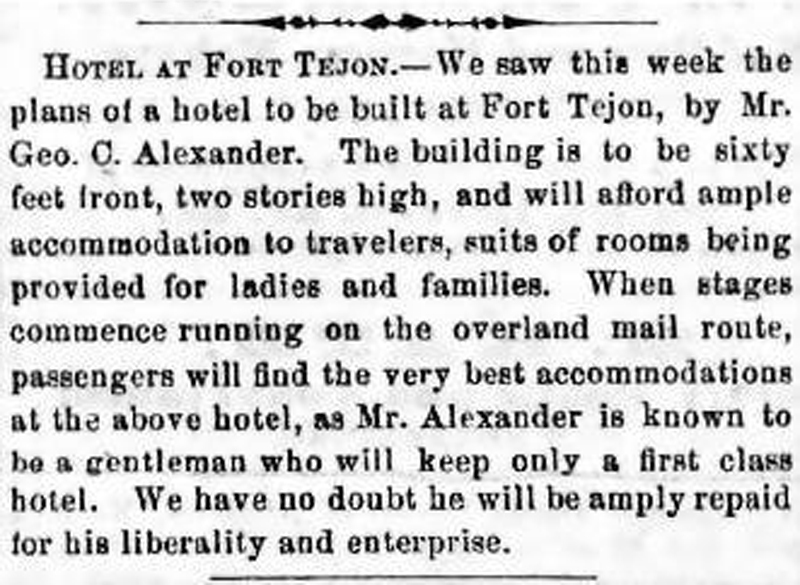 SCVHistory.com | Tejon | Hotel at Fort Tejon, 1858 (not built). Hotel at Fort Tejon (Not Built). Los Angeles Star | June 26, 1858. We say this week the plans of a hotel to be built at Fort Tejon, by Mr. Geo. C. Alexander. The building is to be sixty feet front, two stories high, and will afford ample accommodation to travelers, suits [sic] of rooms being provided for ladies and families. When stages commence running on the overland mail route, passengers will find the very best accommodations at the above hotel, as Mr. Alexander is known to be a gentleman who will keep only a first class hotel. We have no doubt he will be amply repaid for his liberality and enterprise. News story courtesy of Gerald T. Ahnert. According to Ridge Route historian Bonnie Ketterl Kane, George C. Alexander was serving as postmaster and justice of the peace at Fort Tejon in 1858. "His two-story building housed the post commissary and was to serve as the stage stop. It was located across the present highway from the entrance to the Fort and slightly to the south," Kane writes in "A View from the Ridge Route, Vol. 2: The Fort Tejon Era" (2002:140). Despite the glowing announcement in the L.A. Star newspaper, Kane writes (ibid. :141), the hotel "was not built due to Mr. Alexander becoming ill."